Escape the office and share in the great outdoors with your colleagues this summer. Come and join SUP Bristol for an urban adventure as part of your company away day or for something different before the regular team drinks. 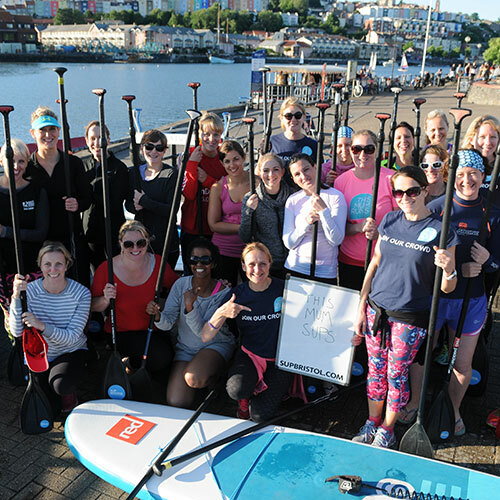 Book an unforgettable paddleboarding experience with us for your next team social or away day. Or why not add paddleboarding to your board meetings before breakfast, during the day or after work. We will work with you to tailor the session to achieve your objectives. There can be games and team building challenges or simply an opportunity to network and socialise standing on water as oppose to sitting at your desk. We have lots of great partnerships across the city so can also support you to arrange conference facilities and additional non water based activities too if you have a particularly large or diverse staff group, or would like to organise a day of adventure for your team. If you are interested in arranging one of our advertised out of town SUP Adventures for your group then please do not hesitate to get in touch to arrange this too. I arranged a team social for 10 of us and SUP did not disappoint! The session itself was brilliant, a mix of games and free paddling, with clear instruction and oversight from Kate throughout. We got a lovely tour of Bristol (with some local facts thrown in!) and everyone really enjoyed it. The organisation and equipment was perfect. Thank you guys!